Normally a tranquil retreat center for church groups and businesses, Campbell Farm outside Wapato was anything but that Monday. An overnight dog attack left three goats, a pig and a miniature horse dead and a donkey mauled. 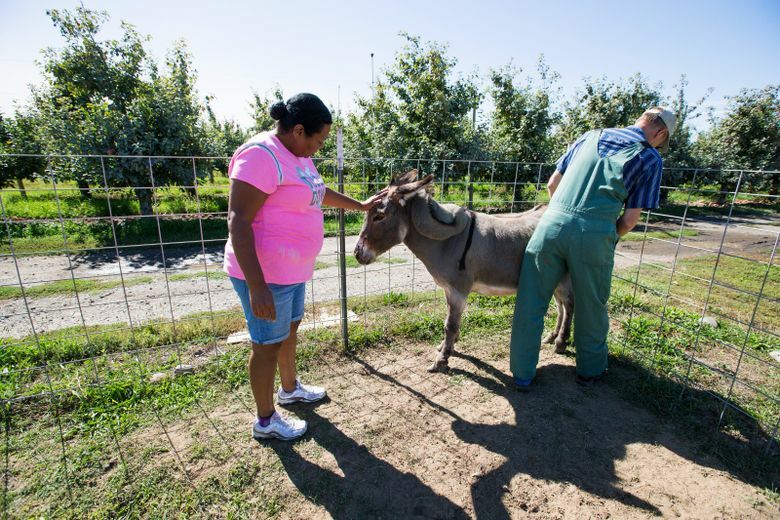 The animals were a part of the farm’s petting zoo and were beloved by visitors who returned year after year, eager to see animals like Betty, the miniature horse who had been at the facility for 13 years, Pimms said. The grisly discovery was made by a maintenance worker, who called authorities around 7:30 a.m. THREE DOGS were still in the corral when Yakima County animal-control officer Randy Sutton and a second officer arrived and shot two of the dogs — A PIT BULL AND A GERMAN SHEPHERD — standard protocol when people or stock are threatened. Unlike the other two dogs, a BORDER COLLIE was not shot because it did not appear to be threatening the donkey, Pimms said. Both dead dogs were checked for microchips and tags, but neither had any identifying information, Sutton said. They appeared to be well-fed and taken care of, Pimms said. There are no plans to search for a possible owner. Pimms said they will keep the surviving donkey in a front pen closer to the staff members’ houses until they feel it is safe to leave him in the pen again.